Val, 32, and Jenna, 25, tied the knot on Saturday, April 13, as Jenna shared a wedding photo of the couple on Instagram and captioned it, "Mr. & Mrs. Chmerkovskiy 04~13~2019." The romantic ceremony overlooked the ocean and took place at the Terranea Resort in Rancho Palo Verdes, CA, People reported. Val and Jenna, who got engaged in June 2018, reportedly exchanged vows in front of 200 of their closest friends and family, underneath a chuppah adorned with tibet roses, ranunculus, astilbe, lisianthus, garden roses and peonies in shades of white and ivory. The garden scene also featured candles of varying heights and modern gold touches. Guests who attended the wedding included former Dancing with the Stars contestants Adam Rippon, Laurie Hernandez, Normani Kordei Hamilton, Ginger Zee, Candace Cameron Bure, Alfonso Ribeiro, Joe Amabile, and Nikki Bella, who went as pro dancer Artem Chigvintsev's date. The following dancers from the ABC reality dancing competition were also present: Val's brother Maksim Chmerkovskiy and his wife Peta Murgatroyd, Witney Carson, Emma Slater and husband Sasha Farber, Cheryl Burke, Mark Ballas, Hayley Erbert, Alan Bersten, and Brandon Armstong. Val sported a classic black tuxedo for his nuptials, while the bride donned an elegant, fitted, mermaid-style gown with sheer long sleeves designed by Vera Wang. Jenna also had her hair pulled back into an updo accented with a large crystal headpiece. Bridesmaids Lindsay Arnold and Gaby Diaz from Dancing with the Stars stood by Jenna's side, according to People, as well as her "bridesman" Adam Rippon, friend Lani, and two sisters. The ladies wore pale pink floor-length dresses, and Adam was asked to wear a beige suit. 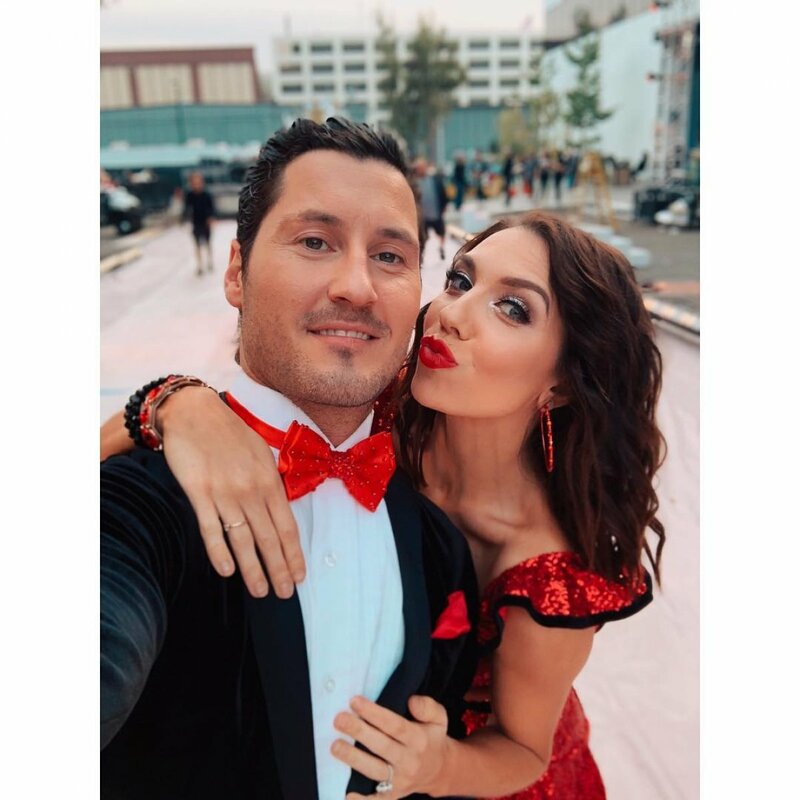 Maksim served as Val's best man, and Val's friends Nicole Volynets, Ted Volynets, Igor Drobyazko, Alex Samusevich and Eugene Livshits reportedly were reportedly part of the ceremony as well. At the reception, the guests dined on crab and avocado salad, braised short rib, dill crusted salmon, cheesecake brulee, chocolate mousse, and more. The couple also danced to the song "La Vie En Rose" for their first performance as man and wife, according to People. One month ago, the So You Think You Can Dance Season 10 alum admitted on Instagram it was "a crazy whirlwind" trying to plan her "dream day" while on tour with the Dancing with the Stars crew. Jenna then celebrated her bachelorette party in Las Vegas with pals including Witney, Lindsay, Emma, Hayley and Britt Stewart. Jenna told Us Weekly in September 2018 that wedding planning with Val was "such a fun chapter" of their lives together. The pair then exchanged a passionate kiss on the Season 25 finale of Dancing with the Stars. When they got engaged last summer, Jenna gushed on Instagram, "I knew the moment I met you, you were the man of my dreams and I wanted to be with you forever. Thank you for making my fairytale come true today! Cannot believe I get to call you my FIANCE!!!! #engaged."